For many Brazilians, Michel Temer's ascension to president was surprising. But as the first Brazilian president to have charges brought against him while in office, his arrest is less unexpected. In 2016, when ex-President Dilma Rousseff was accused of manipulating the government budget and her impeachment trial was launched, then Vice-President Temer stepped in as acting president. As BBC South America business correspondent Daniel Gallas wrote at the time, Mr Temer, had "always been a kingmaker, but never king". In a series of carefully plotted moves, Mr Temer clearly positioned himself as a rival president. Ms Rousseff accused him of orchestrating a coup against her. Daniel Gallas described him as "a skilled politician intent on ending the Rousseff presidency and beginning a new era in Brazil". Although the Brazilian public did not hit the streets to protest against Mr Temer, his approval ratings stayed in single figures. Political scientist Carlos Melo described society as "disenchanted and demobilised" during the Temer tenure. In the October 2018 election, he was replaced by the far-right Jair Bolsonaro. Mr Temer was the first president in Brazilian history to have charges brought against him while still holding on to the top job. He was accused of being the head of a criminal organisation and of trying to obstruct the course of justice. Prosecutors said that back in 2006, when he was still a congressman, he created a bribery scheme that was still alive and well when he became president. His political group allegedly funnelled over 587m reais ($180m, £137m) from state-run institutions such as Petrobras and the Brazilian Lottery into the pockets of lawmakers. He was also accused of pressuring billionaire businessman Joesley Batista into buying the silence of two key witnesses that were co-operating with investigators from jail. 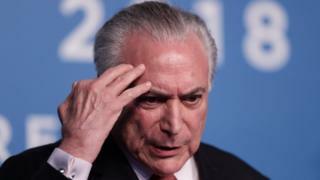 Prosecutors said they had a mountain of evidence against Mr Temer, including video footage of a close aide of his receiving bags stuffed full of millions of reais in a restaurant in Sao Paulo. And two key witnesses have described how the ex-Brazilian president allegedly kept some of the bribe money for himself. Prosecutors say they even have a recording of Mr Temer listening to Joesley Batista brag about bribes the latter paid to judges and witnesses. Mr Temer has denied all the allegations, claiming he was the victim of "coup plotters" and survived two votes that stopped the investigations. However, on leaving office he lost his legal protection, leading to his arrest.